Both my grandfathers have the best stories (as I’m sure yours do as well). I’m lucky enough to live close to my mother’s father and get to hear his stories often but my other grandpa (from now on referred to as Fay) lives in California and I only get to see him once, maybe twice a year. 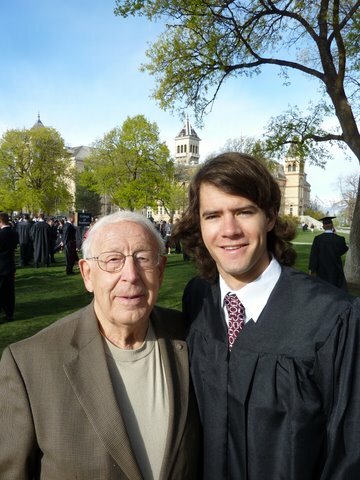 Anyway, Fay graduated from Utah State University years ago, and as the only grandchild to graduate from USU he was quite happy to come up and watch the ceremony last week. The night after graduation we enjoyed a mother’s day dinner outside on the patio, my friend John was there and at the end of dinner I asked Fay to tell John the story about his brother and the atomic bomb (story to come in a future post). After that story we continued to talk about Fay’s experiences in World War II. One story I had never heard before was about this young man, also from Utah, that Fay met in Air-Cor training camp. In 1943, when Fay enlisted, Henry ‘Hap’ Arnold, a general in the Air Force was asking for more Air Force solders. Fay was at training camp in Shepherd Field Texas when a unit of field artillery troops was sent in to begin training as Airmen. Fay met and became friends with a young man named Dilworth Randolph Young. Young was the great-great-grandson of the Prophet Brigham Young and grew up in Ogden, Utah. After Young had been at Shepherd Field for a couple of weeks the government decided they needed some troops back in the field so they took the solders who were originally artillery troops and moved them back to their original unit. As Fay was telling this story he began to choke up but kept going. After hearing the news Young and Fay were talking and Young said, “That’s it for me, I’m never going to make it out of this war.” As a friend Fay told him he couldn’t think like that, he had to be positive and keep his head up. Young ended up being killed in Belgium in 1944. After the war, my grandmother was invited to a wedding in Orem and she asked Fay (not married yet) to come along. The wedding was for Young’s sister who my grandmother had somehow known. At the wedding Fay talked to Randolph’s father, Seymour Dilworth Young, a member of the quorum of the 70 for 36 years, about the friendship he formed with his son. Fay told him about what Randolph said when he found out he was going back to the field artillery unit. Seymour said Randolph asked for a blessing before he left. Seymour and his son went into the mountains and Seymour gave his son a blessing but said that he couldn’t assure him of safety. As my grandpa finished his story he took a bite of the coconut cream pie that had been sitting there since the story began and fell silent. I didn’t know what to say, I really didn’t know what I could say. This generation went through so much, the Great Depression, WWII, Korea, Vietnam, civil rights… They truly are the Greatest Generation and it’s sad to see them slowly passing on. I’m just glad that when this generation is gone we’ll still have their stories. ~ by chj48 on May 12, 2010.